Arhaus Furniture is a national luxury retail furniture retailer dedicated to the design of inspired and quality furniture. The company, celebrating its 30-year anniversary in 2016, is committed to protecting the earth’s resources by developing unique, yet functional pieces from recycled natural resources. “We recycle copper into tabletops, harvest tree roots and transform them into chairs. We find forgotten antiques and give them new life,” according to the company’s website. 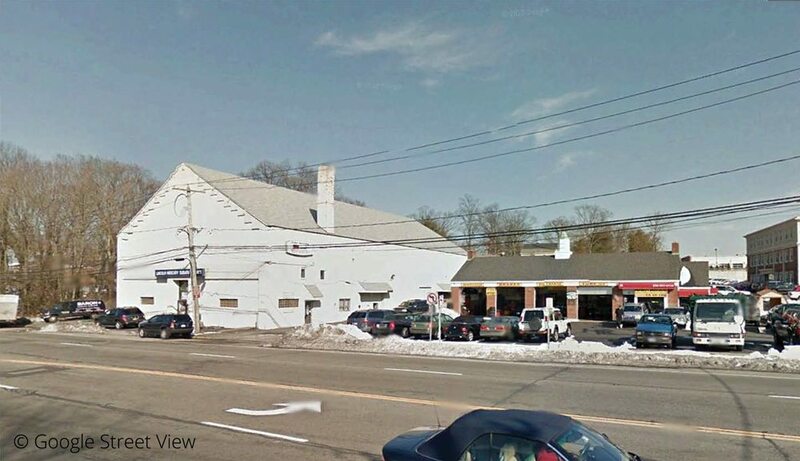 It is no surprise therefore that when they set out to find their latest sales campus in Roslyn, NY, they would set their sights on what others might see as an unusual property for a high-end retailer. The property selected for redevelopment was home to a 1930s car dealership and an adjacent automotive service station; a far cry from the upscale lifestyle centers where the retailer’s other seven stand-alone showrooms reside. None the less, Arhaus CEO and founder John Reed has a vision. As for that rich history, the main building on the property has already been repurposed many times. In fact, the 11,300 sq. ft. structure was originally an early 20th-century airplane hangar that was moved brick-by-brick to the 15 Port Washington Blvd. property and used to build a showroom and service center for the Lincoln Mercury franchise called Port Motors. Highlighting the historical character of the structure would be central to the successful transformation of the space into the showroom for Arhaus’ lifestyle vignettes. Moreover, connecting and integrating the former automotive car service station into a newly attached orangery to merchandise the retailer’s outdoor furnishings would demand the implementation of innovative design strategies. 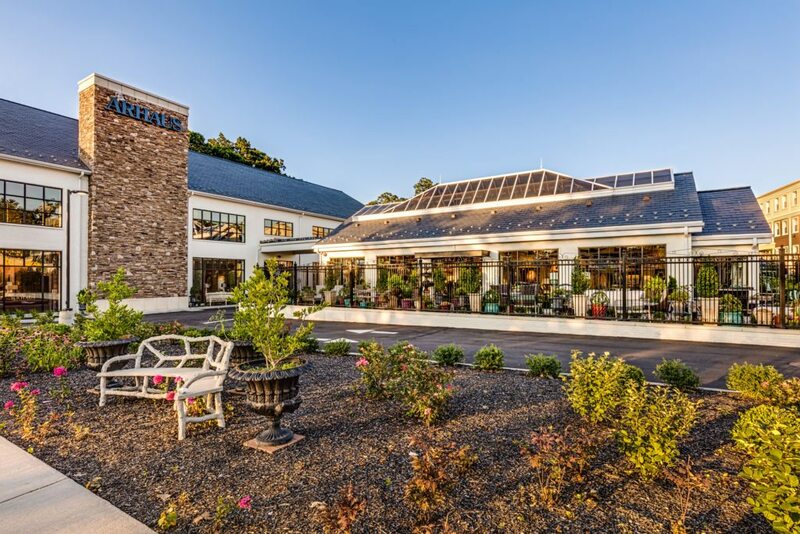 Convert a 1930s aircraft hangar turned car dealership and nearby automotive service station into a luxury retail furniture showroom for Arhaus Furniture’s Roslyn, NY sales campus. 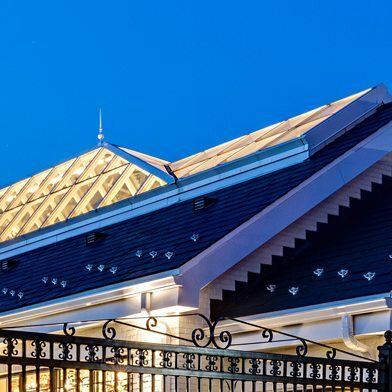 Transform and connect the disparate structures by creating a truly unique skylight that matched the architect’s requirements for the historic building without the advantage of previously engineered templates. 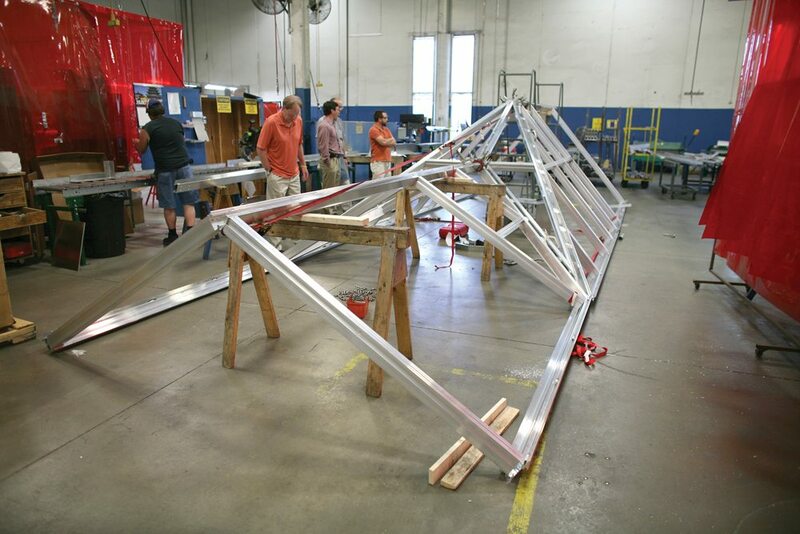 Fabricate a hybrid structural ridge and pyramid skylight system to comply with the extreme angles and tight tolerances of the existing roof line. 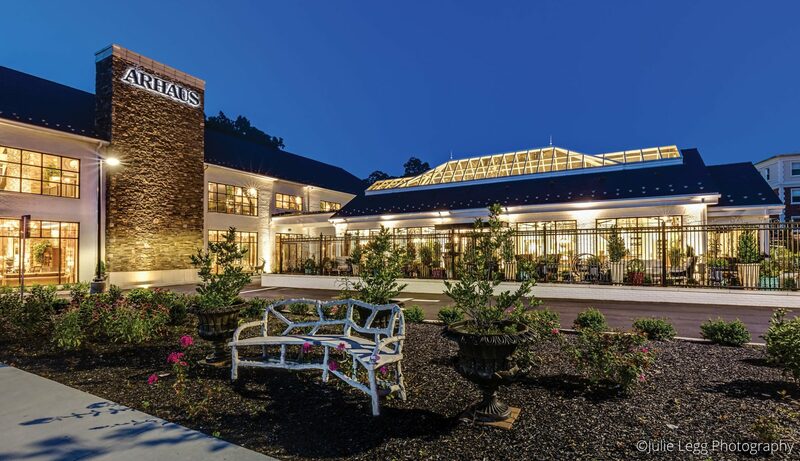 To transform the main building, award-winning RDL Architects added a second-floor mezzanine level, new slate roof, monumental staircase, reclaimed barn flooring, elevator, custom daylight harvesting system. Additionally, the building was updated to meet all current energy codes, including removal of the old oil tank heating system to new efficient natural gas boilers. The outdoor patio features custom wrought iron fencing, decorative patio pavers, an Italian fountain and accent lighting, modeled after an English garden. A new covered porte cochère serves to connect the two buildings and allows for covered drop-off and pedestrian communication between buildings. To recast the nearby former service station into an English observatory-style outdoor furniture gallery, the architects worked closely with skylight contractor Ken Shaw from Wilson-Shaw, the Wasco project management team, and the engineering team at Wasco Skylights. Together they were able to design, engineer, build and install a custom 64′ x 10′ roofing system that includes a special extended pyramid skylight straddling a structural ridge skylight. Ultimately, this roofing reconfiguration was the key to turning the aesthetically unappetizing gas station into a natural daylight-infused observatory style furniture gallery. Due to the complexity of the joining of the units, Wasco’s engineering and project management teams performed a full mock up on the floor to ensure all pieces were fabricated to the tight tolerances and provided step-by-step installation photos to the on-site installers. Wasco’s project manager then coordinated the arrival of all materials to precisely align with the General Contractor’s very tight schedule for opening the roof of the existing structure. “We always use skylights when designing the Arhause Furniture centers, but usually they are domed pyramids added to new buildings. Using this custom double structural skylight system allowed us to completely reinvent that previously utilitarian space into an observatory style design center,” said lead architect Mark Poltorek. Pinnacle 350 Custom Extended Pyramid and Structural Ridges, 64′ x 10′. Glazing: 1-3/16″ IG Bronze Reflective. Finish: Kynar Bone White. For Residential, Senior Living, Retail, Mixed-Use Development and Office, RDL Architects offers a unique, experienced and fresh approach to every architectural design project to bring you new possibilities, potential sources of income, and stunning, thoughtful architectural styles. Before: The 11,300 sq. ft. aircraft hangar- turned car-dealership (left) and an automobile service station (right) before undergoing the transformation. 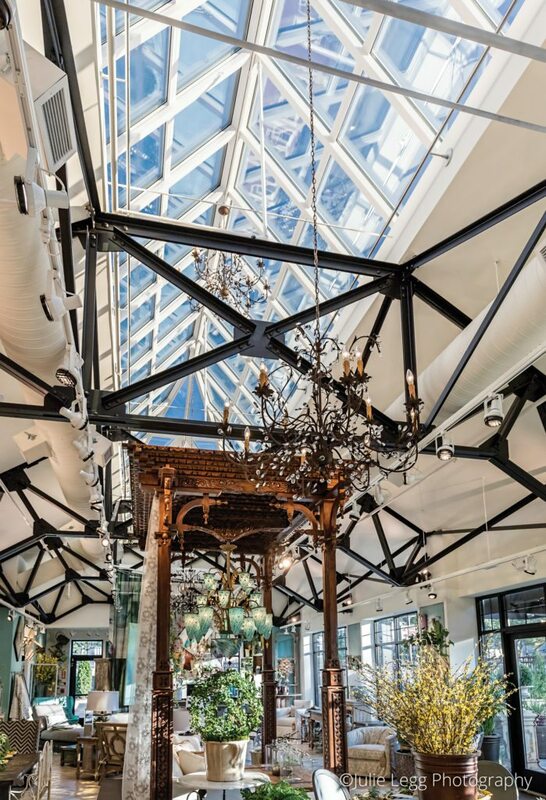 Wasco’s Custom Extended Pyramid Skylight helps bring light and design integrity to the Arhaus 20,000 sq. ft. luxury furniture showroom in Roslyn, NY. Due to the complexity of joining the units, Wasco’s engineering and project management teams performed a full mock up on the floor to ensure all pieces were fabricated to the tight tolerances.